Whether we are in drought conditions or have plenty of water, it is wise to be good stewards of our environment by being efficient with our water use. With that in mind, here are a few tips that will help you conserve water while still enjoying your yard and garden. 1. Water Deeply and Less Frequently. Whether you water by hand, use a sprinkler system or a drip system or a combination of these methods, it is important to remember that it is generally better to water for longer periods of time and less often than watering lightly every day. By watering for longer periods and less often, the water is able to penetrate deeply into the soil which will encourage roots to grow more deeply and be able to withstand drought conditions better. Light or shallow watering will encourage shallow roots and leave the plants more susceptible to stress due to drought conditions. Whenever possible, water early in the morning to decrease the amount of water lost due to evaporation. 2. Water Needs Change. The amount of water your plant needs will change throughout the year and also throughout its lifetime. Young plants will need more regular and frequent watering versus plants that have been in the ground for several years. In the Winter, generally, plants will need very little if any extra water as long as there is regular rainfall. However, they may need to be watered during the Winter if there are long periods of no rainfall. In the Spring, as plants are emerging from dormancy, watering will usually need to increase to sustain new growth, and in the hot Summer months, plants may need additional watering to handle the dry months. Again, a lot will depend on the age and location of your plants. 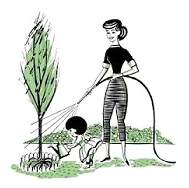 Old, established trees may only need a good soaking once a month during the summer months, while newly planted trees may need to be watered a couple of times a week. 3. Be familiar with your watering system. If you have an automatic watering system, it is important to know how often your system is running, when it comes on, and how long each station runs. You will need to adjust length of time and frequency depending on the time of year and the outside temperature. For example, during the winter season, you may be able to turn off your system for long periods of time if we are receiving regular amounts of rainfall. On the other hand, during dry winters, you will need to continue to water your plants, but not as often due to cooler temperatures. It is important to understand your system, and to ocassionally inspect your system for leaks or for clogged sprinklers or drippers(possibly check your system at the beginning of each season). A broken line or a missing emitter can waste a lot of water. Also, you should avoid watering to the point where you have a lot of runoff ocurring. If you are getting a lot of runoff water, adjust the length of time of watering or adjust the sprinkler heads or drip emitters. 4. Convert sprinklers to drip. If you are using sprinklers to water your shrubs, perennials, and trees, you may consider switching over to a drip system in those areas. Drip systems are easy to install and help save water by focusing the water around the plants that need it. 5. Lawns don't need daily watering. Lawns are usually watered too frequently. It is better to water your lawn twice a week for a longer period of time with only an occasional extra watering during very hot periods. Watering deeply and less frequently will make your lawns less susceptible to changes in the weather. Also, fertilize your lawn every 6 to 8 weeks instead of monthly to reduce excessive growth. 6. Mulch around your plants. One way to conserve water is to apply mulch around your plants at least once a year. Some types of mulch that can be used are high grade soil conditioners (Gold Rush or Rose Planting Mix), barks or cocoa shells. Mulch helps retain moisture and keeps the ground from drying out so quickly. One thing to remember is not to apply mulch too deeply near the base of the plants since the plants still need air flow around their roots. 7. Established plants may be hardier than you think. When thinking about drought conditions, sometimes we rush to remove our existing plants to replace them with more drought tolerant plants. Before doing so, if the plants in your yard are well established, they may already be able to withstand low water use. Established plants often only need infrequent watering since they have been in the ground so long and would be more drought tolerant than newly planted shrubs. As you reduce your water usage, selectively remove plants from your yard that do not perform well under lower water conditions. As you identify these plants, replace them with plants that require less water. And as you plant new areas, use plants that will not be as thirsty as others. 8. Drought tolerant plants to consider. There are several plants that are drought tolerant once they are established and can be a good addition to your yard. Some of these drought tolerant plants include lavenders, salvias, gauras, succulents like sedums, echeverrias, sempervivums, and graptoverias, manzanitas, ceanothus, grevillea, Australian fuchsia, crape myrtles, phormiums, Mexican feather grass, carex grasses, blue fescue, nandinas, cistus(rockrose) and many more. Visit this link for a list of more drought tolerant plants.